There’s nothing like a cold to drive one to comfort food. After a couple of consecutive late nights it was almost inevitable to succumb to a nasty bug. I had a lot of grand plans for the weekend but in the end I ended up tucked up in bed for the better part of the day. Everyone has their own cold remedy. I’ve always been amused that chicken soup is known as “Jewish penicillin”. There must be some magic in warm soups that automatically soothes an unsettled tummy or a congested nose. Soups are also really big for the Chinese and there is a whole culture in the brewing of double boiled soups that use a dizzying array of ginseng, wolfberries, cordyceps, Angelica root and many others. I didn’t want to spend too much time brewing this soup, which was yet another wonderful opportunity to put my new toy, the Instant Pot, to use. I didn’t really want to spend too much time and had been getting hungry after being tucked up in bed for the best part of the day. Rummaging in my pantry I discovered some dried porcini mushrooms that I had forgotten for a while. So this became a chicken and mushroom soup, and I also added a little pumpkin for the carb craving I seem to get when I am sick. The soup in the end was full of chicken and lots of vegetables. Nutritious and still relatively low carb. The flavour was rich and comforting. So now I’ve proven that the Instant Pot is a lifesaver, even when one isn’t feeling well or up to cooking much. I feel better already. Soak the dried porcini mushrooms in 1 cup hot water. 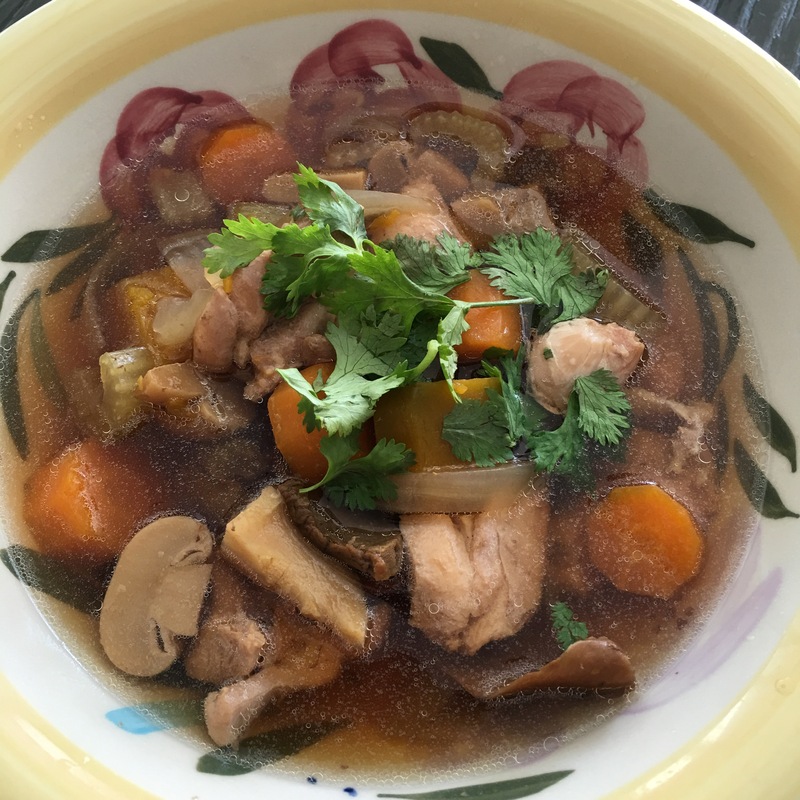 Place the chicken, carrots, celery, pumpkin, onion, button mushrooms and porcini mushrooms and soaking fluid into the Instant Pot. Add the salt, pepper, ginger and bay leaves and stir to mix. Put the Instant Pot Soup program on. This lasts about 30 minutes. When done, do a quick pressure release. Serve the soup hot with some coriander to garnish.